We have retired from the nursery business. We have stopped exporting from the U.S.A. and the mail order sales even within the U.S.A. have halted. This past summer's were the last walk-in sales here at the garden. Our credit card account and toll-free number have been discontinued. We really are hanging up the harness. It may take some time for us to get the web site completely converted to strictly informational materials, but that is the eventual goal. Visits by appointment only: P.O. Box 92, Westfield IN 46074. 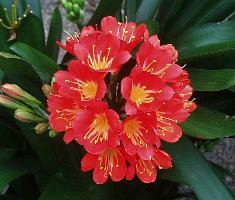 Our peak Clivia bloom season is usually in March. Our iris collection blooms mostly in May. 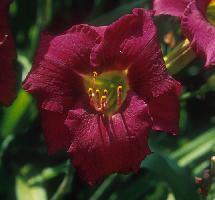 Our peak daylily bloom season is usually late June and early and mid July. Since we are looking for extra-early and very late blooming varieties of daylilies, you can expect to see some daylilies in bloom from mid-May through mid-September. © COPYRIGHT 2011 BY JAMES E. SHIELDS. ALL RIGHTS RESERVED.